In today's world, many of the necessities we have in our lives are made in China. Low cost labour, low cost land and low cost raw materials. It makes economical sense to build manufacturing plants and hire the locals and even train them to be on par with developed countries' blue collar workforce. Most IT and computer products are made in China. Cellphones, TVs, DVD players and even some car parts are manufactured, assembled and exported from China. As the world's need for lower cost products increases, so does the China's economy. Lesser unemployment rate for the country with largest population in the world. Tons of money from foreign investments, not to mention tons of previous unused land now leased to big corporations. With the speedy industrialization and urbanization of China, the world is watching its progress. To ensure quality products from China matching those made previously in european or south-asian plants, additional quality checks are enforced on the products made in China. 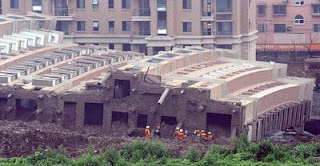 Just a day before, this happened in a Minhang District of Shanghai, China. 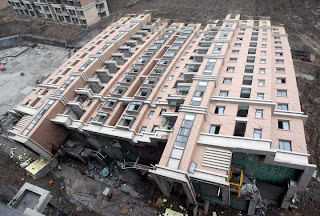 An entire building toppled and fell over like a chopped tree. Fortunately, it is still under construction and currently uninhabited. Looking at the way the rest of the structure maintained its rigidity, some good may be said about its build. But to the manner which the groundwork is done, one can only shake their head and sigh. You can laugh and you can joke about it. China-based construction companies in Singapore building HDB flats may or may not be the same construction companies that developed the above mentioned housing in Minhang District, Shanghai. A Poem for Nathaniel Neo, my newborn son.